In this blog post we’ll see how to register vCloud Application Director to vCloud Automation Center. In our previous blog post we saw how to do the basic configuration of Application Director after doing the initial power on. When you register vCloud Application Director, you use the CLI to establish a connection between the vCloud Application Director environment and the vCloud Automation Center server so that you can access the vCloud Automation Center service catalog. When the connection between vCloud Application Director and vCloud Automation Center is established, you can publish the deployment profile to the vCloud Automation Center catalog so that other users can request the deployment profile and use it. ■ Verify that your user account has the ROLE_SYSTEM_ADMIN system administrator role assigned to it. ■ Familiarize yourself with the roles available for users. ■ Verify that you know the password for the darwin_user. This password was set during installation. ■ Start the vCloud Application Director CLI. ■ The vCloud Automation Center 6.0 IaaS environment and endpoints must be properly set up and configured. ■ You must have SSO admin credentials available. We will first see how to start the vCloud Application Director CLI remotely. You can start the vCloud Application Director CLI from a remote machine. As a best practice, run the CLI remotely to reduce server load and avoid shared CLI on the vCloud Application Director appliance. The connection from the remote machine to the CLI is secured. ■ Verify that you know the password for the vCloud Application Director appliance. ■ Verify that you installed Java (JDK 1.7) on your remote machine. ■ Make sure that the remote machine can connect to the vCloud Application Director appliance using HTTPS. 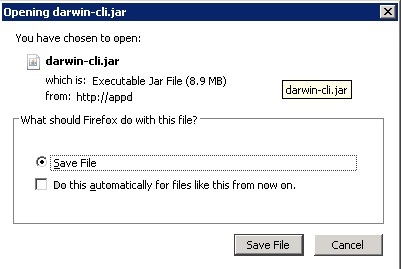 Download the darwin-cli.jar file from the vCloud Application Director server http://DarwinServerIP/tools/darwin-cli.jar to a folder with write permissions on the remote machine. Then save the file to your computer. Open a command prompt and start the client. The Darwin CLI banner appears and the appd> CLI prompt appears. Log in to the vCloud Application Director server. You are logged in to https://192.168.10.173:8443/darwin as admin. In the roo shell prompt, register vCloud Application Director to the vCloud Automation Center server. The componentRegistryUrl is the URL for the vCloud Automation Center Self Service Catalog. vCAC server registered successfully status. Synchronize groups from vCloud Automation Center to vCloud Application Director. View the vCloud Automation Center server information. In the Next blog post we’ll see how to publish vCloud Application Director deployment profiles to the vCloud Automation Center catalog. PaaS with vCloud – Part 6 : Creating a Cloud Provider for vCAC in vCloud Application Director.